Copyright 2011 Nova Science Publishers. Guidelines are widely used as a method for translating research evidence into clinical advice for medical practitioners. However, in many cases the uptake of guidelines is poor, for example, hypertension management guidelines. We conducted a qualitative research project to explore the barriers to the optimal treatment of hypertension by GPs. In our research we found that rather than a lack of knowledge and awareness of the existing hypertension guidelines, other barriers were operating such as: clinical uncertainty about the true underlying blood pressure and distrust of the technology used to measure it; distrust toward the evidence underpinning the management of hypertension; patient age, gender and co-morbidity; perceived patient attitude; clinical inertia; whole-person care and systems issues such as lack of resources and lack of time in consultations. 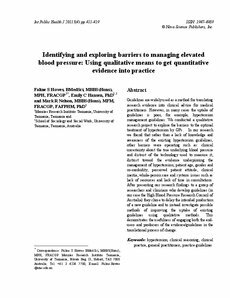 After presenting our research findings to a group of researchers and clinicians who develop guidelines (in our case the High Blood Pressure Research Council of Australia) they chose to delay the intended production of a new guideline and to instead investigate possible methods of improving the uptake of existing guidelines using qualitative methods. This demonstrates the usefulness of engaging both the end-users and producers of the evidence/guidelines in the translational process of change.